When you need any kind of heating or air conditioning service, make sure that the company you turn to is Quality Air Heating and Air Conditioning. We offer a full line-up of heating and air conditioning service in Sunbury, OH for many different types of HVAC systems. From furnaces and ductless mini splits, to central AC, heat pumps and more, we offer installation, repair, maintenance, and replacement. Call us 24/7 for emergency heating and air conditioning service and you’ll always get a live person on the other end of the line. When the weather turns cold, you need a reliable and efficient heater in order for your home to stay comfortable and safe. Quality Air Heating and Air Conditioning offers comprehensive heating service in Sunbury, OH for many different types of heating systems. We can help you install a new heater in your home if yours has failed permanently. We also provide an outstanding maintenance program that includes annual tune-ups, reduced pricing and much more. Of course, we offer 24/7 emergency heating repair in Sunbury, OH because we know that sometimes you’ll need a technician in the middle of the night if your heater breaks down. Call us today to talk with one of our friendly experts. Is your heating system making a funny noise? Is it blowing cold air instead of hot? These are both common problems that mean you should call Quality Air Heating and Air Conditioning for Sunbury, OH heating repair service. We understand that your home relies heavily on your heater during the winter months and we are dedicated to providing you with the top quality service that you deserve. Call us today and one of our Sunbury, OH heating repair experts can talk with you about the service that you need. Start your new heating system off on the right foot with quality heating installation in Sunbury, OH from Quality Air Heating and Air Conditioning. We don’t just show up install your heater and then leave. We help you through the entire process and make sure that the heating system you get in your home is the right size, the right type and a good fit for your budget. Poor installation is one of the main causes of problems with heating systems, so make sure that you work with the pros at Quality Air Heating and Air Conditioning for any heating installation that you need. For all your air conditioning service in Sunbury, OH, call Quality Air Heating and Air Conditioning. Our years of experience and our technicians’ extensive training allow us to provide all of our customers with the high quality service that they deserve. From new installation and replacement to repairs and maintenance, Quality Air Heating and Air Conditioning offers a full line-up of air conditioning service. We’re available 24/7 for emergency air conditioning repair in Sunbury, OH so call us any time. Is your air conditioning system making an unusual noise or failing to produce enough cooling? Quality Air Heating and Air Conditioning offers fast, reliable and high quality air conditioning repair in Sunbury, OH. We can work on all types of air conditioners, so whether you have a heat pump, central AC, a ductless mini split or any other type, just give us a call as soon as you suspect that something is wrong. We are dedicated to providing all of our technicians with timely and good services so call us 24/7 for air conditioning repair in Sunbury, OH. Don’t let anyone but the experts at Quality Air Heating and Air Conditioning install your new air conditioning system. Doing so could cause your new unit to be improperly installed, which might cause efficiency problems in the future as well as the need for repair. Quality Air Heating and Air Conditioning offers air conditioning installation in Sunbury, OH for all types of systems. When you call us for installation service, our technicians will work to determine exactly what size of air conditioner you need so that your new unit will operate as best as possible. Call us today! Maintenance is an often-forgotten task that homeowners need to have done for their air conditioning systems to operate as intended by the manufacturer. As your AC system works to cool your home, it will naturally develop small issues which eventually turn into larger, more costly repairs. But when you work with Quality Air Heating and Air Conditioning and schedule air conditioning maintenance in Sunbury, OH, you could avoid many repairs and increase the efficiency of your AC system. Call us today to find out more about how our maintenance program could help keep your air conditioner operating properly. If your air conditioning system is old and has started to require more frequent repair, don’t risk the comfort of your home: call Quality Air Heating and Air Conditioning for air conditioning replacement in Sunbury, OH. Finding a new air conditioning system can be difficult because there are so many types and brands to choose from. We’ll make it easy for you when our techs help you pick out a new system that fits your home’s size and your budget. Call us today for more information. Quality Air Heating and Air Conditioning is proud to offer commercial HVAC service in Sunbury, OH for all types of businesses. We are the one-stop-shop for your business when it comes to your heating and air conditioning system. Our experts can help you find a new HVAC system if you need one installed, and we’re available 24/7 for emergency commercial HVAC repair in Sunbury, OH as well. Give us a call if you aren’t getting enough heating or cooling, or if you’re ready to replace your entire system. Repairs are inevitable with any piece of equipment and your HVAC components are no exception. For any commercial HVAC repair in Sunbury, OH that you need, make sure that you work with a professional technician. Don’t try to go up and tinker with your heater or AC. Doing this could risk even more problems developing or you could permanently damage your system. Quality Air Heating and Air Conditioning offers 24/7 commercial HVAC repair in Sunbury, OH for all types of equipment, so give us a call anytime. If you’re starting a new business and need an HVAC system installed, contact Quality Air Heating and Air Conditioning. We have years of experience in the industry and we’ve worked with businesses of all types of help them get terrific heating and cooling. Having your new system installed by an amateur will likely cause future problems for your business’ comfort and efficiency. We offer commercial HVAC installation in Sunbury, OH and our technicians will ensure that any new equipment you need installed is done properly. Maintenance is absolutely critical if you want your business’ HVAC system to operate at peak performance levels. 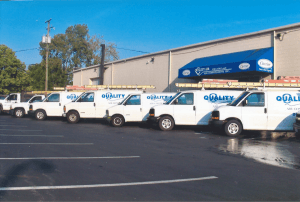 Quality Air Heating and Air Conditioning offers total commercial HVAC maintenance in Sunbury, OH and our program includes annual visits, reduced pricing, priority service and much more. Having your heating and air conditioning systems inspected could help reduce repairs, increase efficiency, and also keep your equipment operating for as long as possible. Give us a call today to learn more and to talk with one of our specialists about any maintenance service that you need. Heat pumps are prized by homeowners because they provide efficient heating and cooling. Quality Air Heating and Air Conditioning offers total heat pump service in Sunbury, OH for all brands of systems. Whether you need to replace your current heat pump with a new one, or if you’re interested in switching from a furnace or central AC to a heat pump, let us know. We can talk with you about the installation process and make sure that you get a heat pump in your home that matches your needs and your budget. We’re available 24/7 for emergency heat pump repair in Sunbury, OH in case something happens after hours. Furnaces are probably the most common heating system in the country due to their efficiency and also their long life. For all your furnace service in Sunbury, OH call Quality Air Heating and Air Conditioning. We can help you install a new furnace if yours needs replacing and we can also maintain your furnace to keep it operating properly. If your furnace is blowing cool air or if it is making any unusual noises call us for furnace repair in Sunbury, OH.